Highlights the achievements and work of the service for the financial year 2011 to 2012. 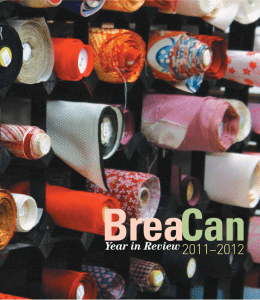 This year’s publication reflects on what is the ‘fabric of BreaCan’ – the things that make the service special and unique, alongside the many achievements reached in the past financial year. Of note are the four personal stories of women who have used the service, their words describe the many elements which make up BreaCan’s fabric.